There is a consensus between fans and hockey experts alike that the Arizona Coyotes have one of the top prospect pools in the NHL. With players like Dylan Strome, Clayton Keller, Christian Fischer, and Kyle Wood headlining that pool it isn’t hard to see why. But among the many prospects that draw their rightful attention, one name has continually gotten lost in the noise. Left shooting defenseman Kyle Capobianco was drafted 7th overall in the 2013 Ontario Hockey League (OHL) Priority draft by the Sudbury Wolves. He was then drafted 63rd overall in the 2015 NHL Entry Draft by the Coyotes, the only defensemen they took in the draft. The 2015 NHL draft also saw the Coyotes pick Dylan Strome, Nick Merkely, Christian Fischer, Adin Hill, Jens Lööke, and Conor Garland among a few others. Since there were a bevy of big named prospects taken in that draft alone, it isn’t hard to see why Capobianco wasn’t as highlighted as other Coyotes prospects from day one. Perhaps Capobianco’s biggest reason for falling to the third round was that he was playing for one of the weaker OHL teams, the Sudbury Wolves. However, even playing on a weak OHL team, Capobianco put up very respectable offensive numbers as a defenseman: 27 goals and 114 assists in 254 regular season OHL games. Capobianco would go on to wear an “A” on his chest for his second and third OHL seasons, only to have that replaced with a “C” during his fourth season with the Wolves. During his latest campaign with the Wolves in the 2016-17 season, he would lead the Wolves to their first playoff appearance since his rookie season. The biggest personal knock against Capobianco in his draft year was his size. When drafted, he was 6’1” and a little north of 170lbs. Coming into this season’s training camp, Kyle Capobianco is weighing in closer to 200lbs. All these numbers and sizes are great, but how will that translate on the ice heading into his first year in professional hockey? And what separates him from the average NHL defenseman prospect of similar size and junior numbers? This preseason, the Coyotes elected to join the San Jose Sharks, Anaheim Ducks, and Colorado Avalanche in a rookie showcase in San Jose that started on Saturday the 9th and ended on Tuesday night. Kyle Capobianco played in the first game on Saturday night, debuting in the Right Defense position. You can read about the problem of the Coyotes defensive depth here, but the short of it is that there are not a lot of open jobs throughout the Coyotes system on the left side of the blue line. Could it be that the Coyotes opted to see what Capobianco could bring on his off-side to move him up the depth chart? Whatever it was that the Coyotes were looking for in Capobianco, they obviously saw it. That game would be the only game Kyle played during the showcase, electing to sit him the final two games to get further exposure to other Coyotes defensive prospects. He obviously turned a lot of heads in the one game he played. #Coyotes defender I am most impressed with has been Kyle Capobianco. Captained a bad Sudbury Wolves squad last year now turns pro. Capobianco’s biggest strengths are in his skating and puck movement. In this year’s prospect camp and rookie camp he has shown he isn’t afraid to jump up and make plays happen. In addition, he has also looked comfortable in his own zone breaking up plays and disrupting passes. Having good puck-moving defensemen is becoming more and more important to NHL clubs, and Capobianco certainly seems to fit that role. It isn’t outlandish to envision Capobianco making an appearing in the NHL for the Coyotes within a year or two. With training camp in full swing, it will be interesting to see just where the Coyotes new coaching staff decides to play and position Capobianco. 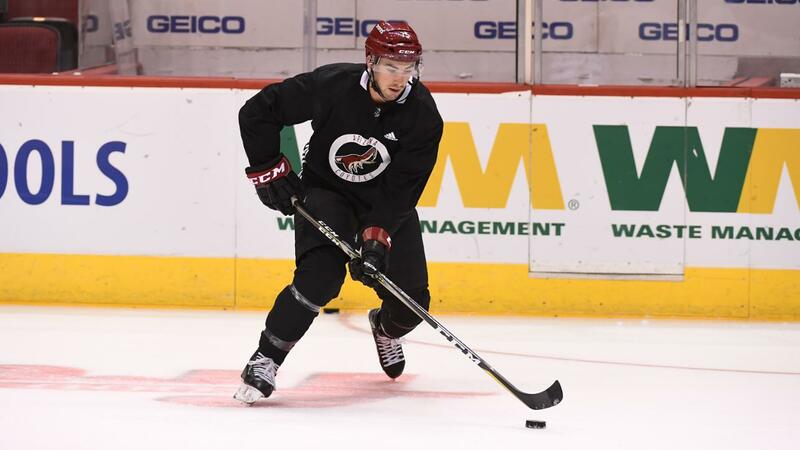 It would be safe to assume that he does not see any time in the NHL this season, however, he is poised to have a great rookie season with the Tucson Roadrunners of the AHL. Time will tell just what side Capobianco will play and where he falls on the Coyotes depth chart. However, one thing is certain: Kyle Capobianco is arguably the best Coyotes prospect that does not get his share of the excitement of fans and media alike.